Red River Real Estate and Vacation Rentals - Arnold's River Retreat, Red River, New Mexico. Arnold's River Retreat is a beautiful two story home that sits on the river. This large home has six bedrooms and five bathrooms that will give many in your party the space they desire! Upon entry of this home you will see the living room to the right, featuring new living room furniture and a flat screen TV with a DVD player where you can choose to watch cable or enjoy watching movies brought from home. One of the sofas in the living room is a sleeper sofa and can be used as a queen bed for additional sleeping. Sitting right off of the living room, you will notice a small sun room -- pull back the shades to enjoy the sunlight on a cold day or to enjoy reading! To the opposite side of the living room, there is a door leading to the accessible garage -- inside you will find the perfect place for the young ones to play. Arnold's provides an Air Hockey and a Ping-Pong table for guests enjoyment! Just past those rooms you will come to find the kitchen and dining area. Arnold’s River Retreat features a large kitchen with plenty of counter space for as many cooks in the kitchen as you want! The dining room table is located off to the side of the kitchen and has additional seating at the kitchen bar. In the yard you will find two picnic tables and a gas BBQ grill for cooking out! Let’s not forget the fire pit for everyone to enjoy the fire while listening to the river that is just a gate away. This home provides guests with free WiFi to use during their stay! After leaving the kitchen, you will find a separate laundry room with a washer/dryer for guests to use during their stay. At Arnold's River Retreat guests are given free laundry detergent courtesy of Red River Real Estate. The first main level bedroom has a king bed for guests' comfort, with access to the hallway ¾ bathroom. The next room over also includes another king bed with a twin bed off to the side. This spacious second bedroom has a small flat screen TV, as well as access to its own private full bathroom. Both of these main level bedrooms are very spacious with large closets for storage. The second level is where you will find the other four large bedrooms. To the very far right you will find another king bed with a twin bed off to the side. This bedroom has a TV, and access to its own private bathroom and a private balcony. The next room has a king bed and access to a full bathroom. The third upstairs bedroom you will find a queen bed that has a large closet and access to the hallway full bathroom. The last room upstairs has several sleeping arrangements and has access to the hallway full bathroom. There is a queen bed to the left of the room and to the right you will find two Queen futons that each can be made to sleep additional people. This room also has a TV perfect for setting up game consoles! Arnold’s River Retreat is a great home for large parties and is loved by many who stay here. You cannot beat the location on the river, not to mention the ability to sleep up to 20 people comfortably! Arnold's River Retreat allows garage access. Two story home with only a couple steps to entry, with main level bedrooms. Four king beds, two queen beds, two twin beds. 2 Queen futon sleepers, 1 Queen sleeper sofa. On the river with seating. Living room includes, flat screen TV, DVD player, separate sun room, and wood burning fireplace. 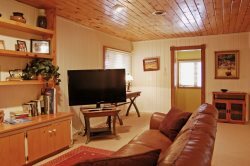 Arnold's River Retreat provides cable, free WiFi, washer/dryer(Detergent provided by Red River Real Estate), and a gas BBQ grill. Access to the garage where you will find a Ping Pong table and an Air Hockey table. Arnold's River Retreat pet policy: Sorry no pets! Very roomy, clean and comfortable! Everyone was super nice! We even had to call them after we left because a ring was left in the house. They went right over & found the ring & are shipping it to us. Thank goodness there is still honest people! Thanks!! Plenty of room for our group at Arnolds River Retreat. We liked that it was just west of town & we could ride our ranger to the trails. Very friendly and helpful. No complaints. Week went by much too fast, and now we're back in 99 degree and humid weather. Our visit was great while it lasted. You are fortunate to live where you do. We have stayed in Arnolds river retreat 4 or 5 times. Booking thru red river real estate each time. Staff is always friendly and knowledgeable of the house, the town and the best fishing spots! Will see you next year. May be a different month but will be the same house! We have used RRRE in the past, always with great success! Completely awesome, professional, and fun! Staff is very friendly and helped find thins of interest for our youngest (2 and 4 years) travelers. Wish the pots and pans were not so hard to cook in. Looked like they have been used and abused by people who don't know about electric stoves.